A perfect marriage between blushing apples from the north and sun drenched figs from the south. When cultures meet you often get beautiful combinations. Muffins to remember the summer and take in the goodness of winter. The smell is great, the taste even better. Preheat the oven to 180ºC / 355ºF. This is a basic muffin recipe that you can use to make all kinds of combinations with fruits and nuts and spices. Its simple, first you mix all the dry ingredients in a bowl. In a separate bowl you mix all the wet ingredients. You can make the fig paste in advance. Boil the figs in some water until soft. Leave to cool. Add honey and a touch of cinnamon and blend in to a paste. Then put the wet and dry ingredients together, but do not over mix. 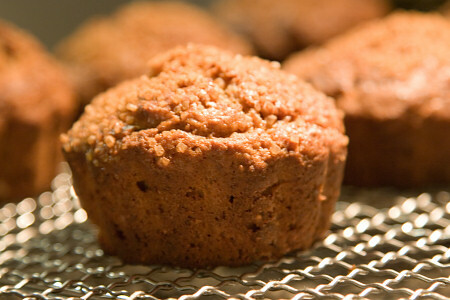 Fill a muffin tray with the mixture and sprinkle each heap with the cinnamon/sugar mix. I use organic cinnamon that has a more intense flavor. Bake the muffins for approx. 20 minutes and leave to cool on a tray. Or better: eat warm from the oven, but do not burn yourself on the pieces of apple, they tend to be hot longer because they contain more water. Tip: Make sure your ingredients, including your spices, are fresh. Like ground coffee, ground spices also lose their intensity very quickly. You can grate cinnamon yourself with a Microplane. PS: Yesterday I made cranberry syrup based on a recipe from the book ‘ Apples for Jam’ by Tessa Kiros. It’s really nice and fun to make. Dit ga ik maken met mijn kleinkinderen als ze komen logeren.Als ze iets leuk vinden is het wel helpen met koken, bakken en braden.Altijd een ,,feestje,,. Het lijkt me zelf ook heerlijk.De yoghurt en honing erdoor en niet te vergeten de appel. What a great recipe, these look so good and moist. Love the addition of the yogurt.